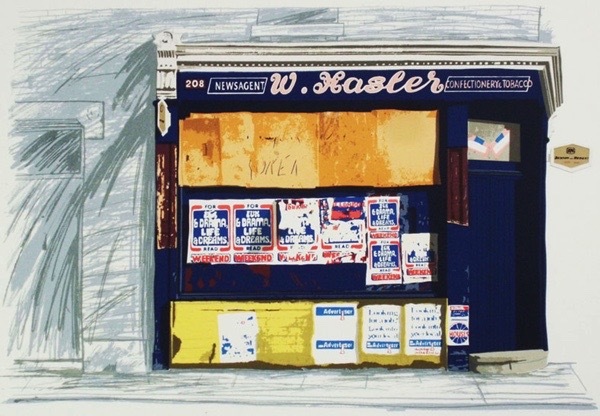 MR HASLER’S SHOP (Screenprint) on the corner of Eric St and Bow Common Lane had seen better days. It was not always clear whether it was open or not, because it very dark inside with the windows boarded up. I do not remember it selling much more than newspapers and a few cigarettes, but I do remember having our Sunday paper delivered by Mr Hassler himself or, more often, by Mrs Hasler. Hasler’s is no longer a shop. 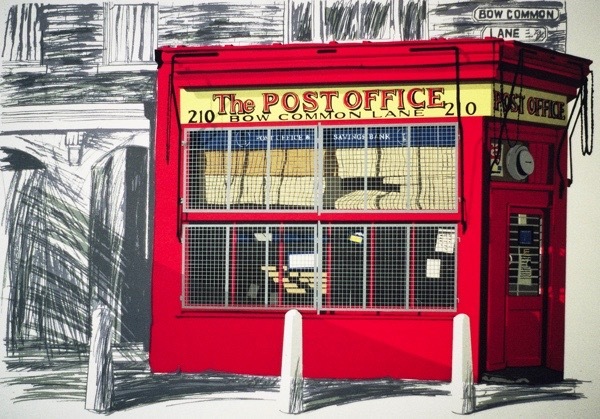 THE POST OFFICE (Screenprint) was on the opposite corner of Eric St and Bow Common Lane. It is no longer a shop. 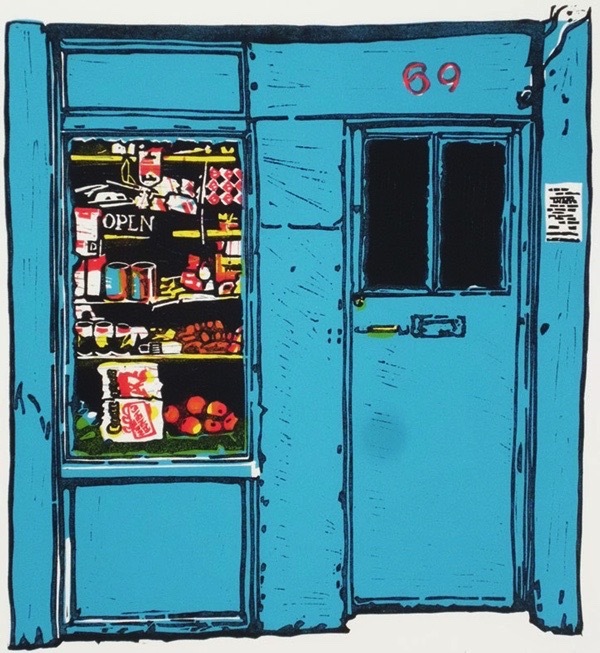 JESSIE’S PROVISIONS (Screenprint), our local grocery store, was further down Eric St on the corner of Hamlets Way, where you could buy everything you needed including fresh bread, delivered twice a day, warm from the bakery. 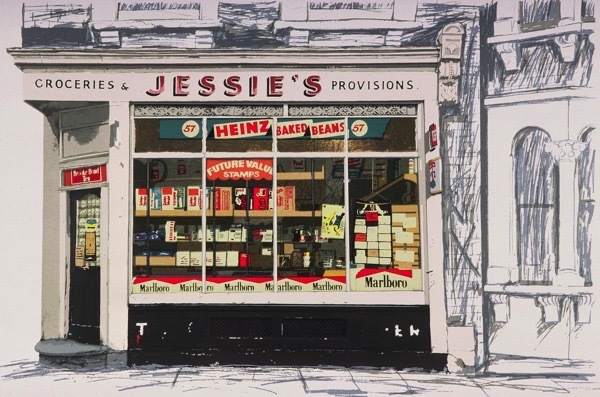 Jessie’s is still a grocery shop. 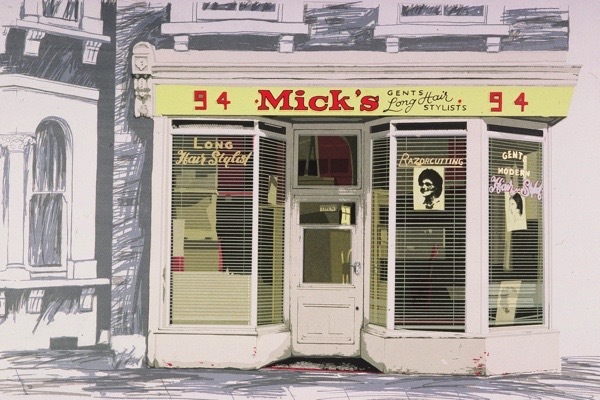 MICK’S GENT’S LONG HAIR STYLIST (Screenprint) was on the next block along Hamlets Way, on the corner of Mossford St. Mick was Maltese I think and claimed to be a ‘Gents Long Hair Stylist,’ although I think he was more of a traditional barber. I remember taking my son there as a small boy, he sat on a plank balanced across the arms of the barber’s chair and always chose one of the Italian styles pictured on the wall, maybe a Tony Curtis. He looked stylish afterwards but his hair soon reverted to its more usual Dennis the Menace look. Mick’s is still a barber’s shop. 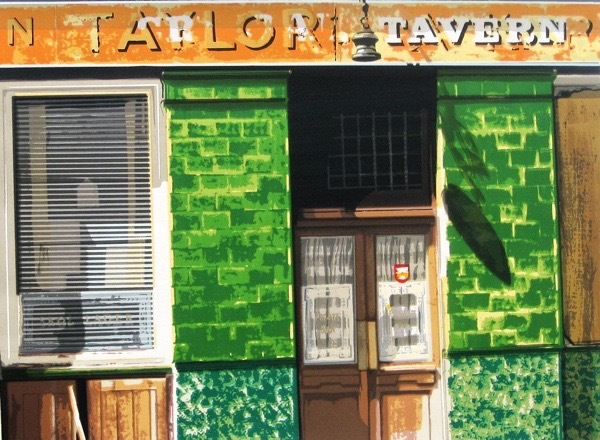 THE CRYSTAL TAVERN (Screenprint) was on the other side of Hamlets Way on the corner of Burdett Rd. The sign was worn away, so it was more often referred to as ‘the dive’ or sometimes’ The Arbus Arms.’ The interior was all faded plush, gilt and mirrors with a barmaid to match. 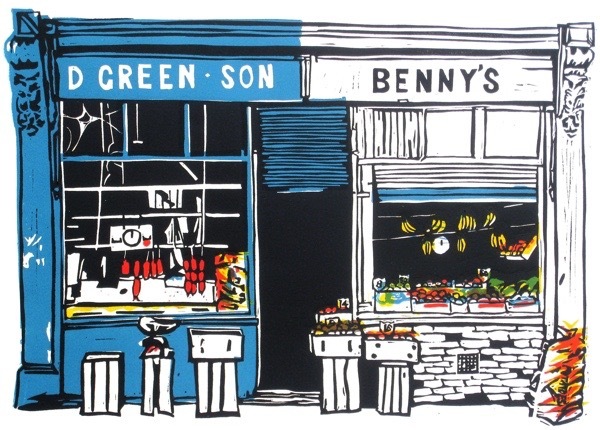 BENNY’S (Linocut) was on Hamlets Way opposite The Crystal Tavern. 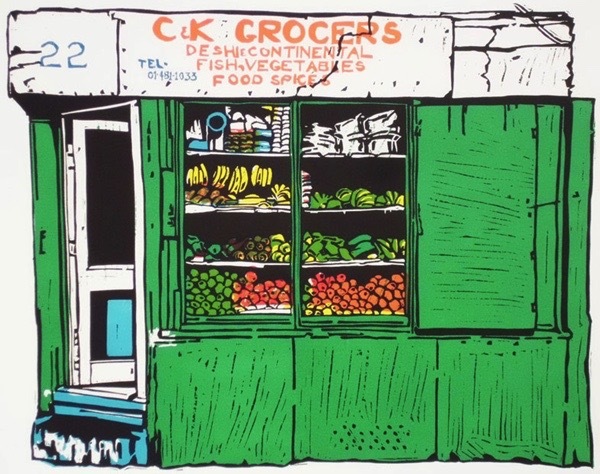 It was more a hole in the wall than a shop but I bought all my fruit and vegetables there, served at first by Benny himself, sometimes his wife, then his two sons and finally their grandsons. During Apartheid, I asked where their apples came from, not wanting to buy anything from South Africa, and was always assured that they came from somewhere else but I was never convinced. The family did pretty well from the shop yet, although they had smart cars parked up the street, they never spent any money on improvements or heating in the winter. Benny’s shop is now a takeaway pizza outlet. 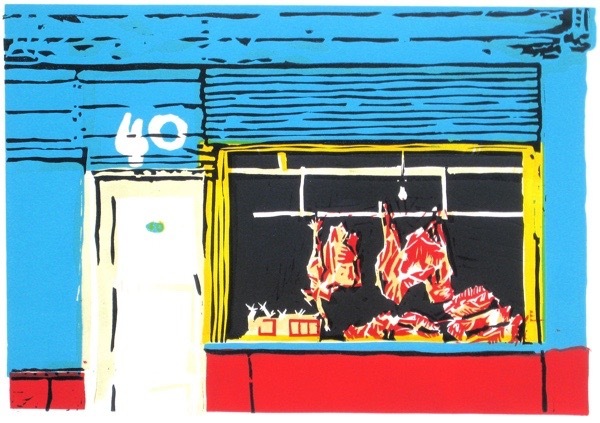 40 HESSEL ST (Linocut) Next I turned to Whitechapel, especially Hessel St which had lots of colourful shops that were very suitable for linocuts. 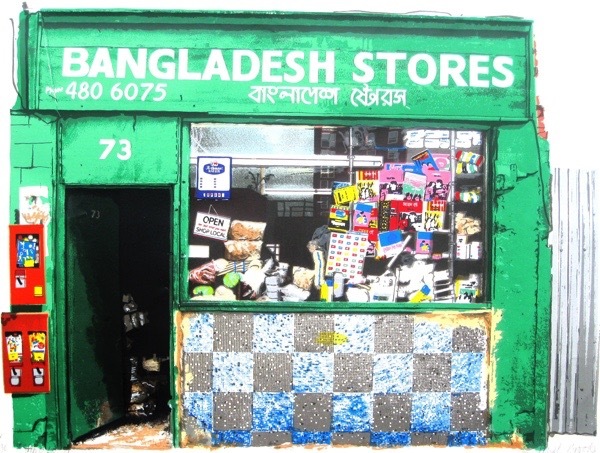 They were nearly all Bangladeshi businesses with a just few remnants of the Jewish ones left but, within a couple of years they had all been homogenised by modern shop fronts, no more individually hand-painted, and sometimes misspelt signs. 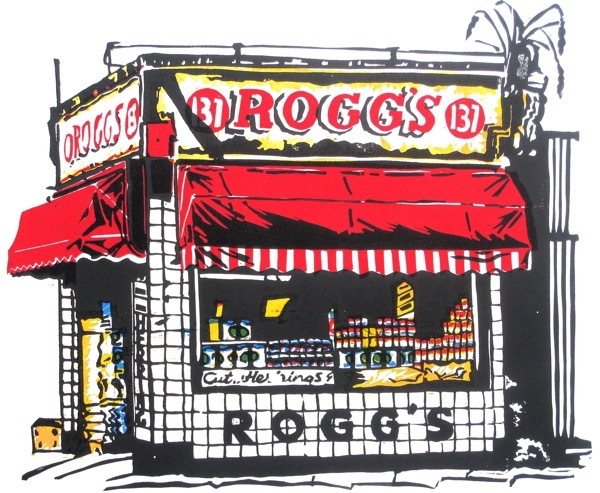 ROGG’S (Linocut), round the corner in Cannon Street Row, was one of the last Jewish deli’s in the East End, where customers came from miles around to get their beigels and pickles. The site of Rogg’s is now a parking lot. 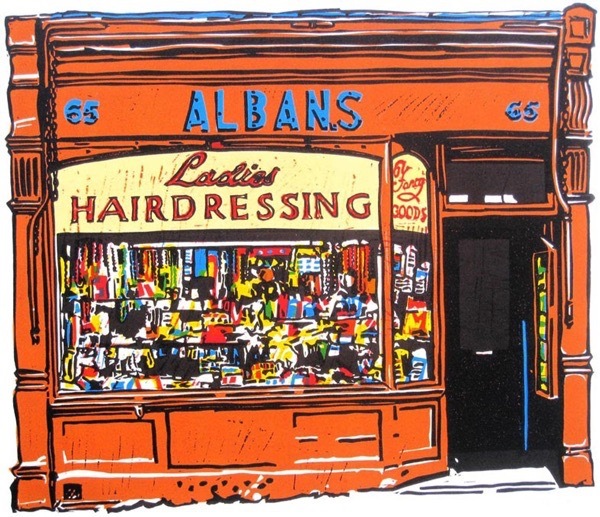 ALBAN’S LADIES HAIRDRESSING (Linocut), 65 Roman Rd, specialised in ladies hairdressing supplies and never stinted on the window display. It later became an art gallery and is now a coffee shop. ACKERMAN’S BUTTONS LTD (Linocut), 326 Hackney Rd, was a pretty basic shop with no window display and inside just stacks of cardboard boxes of buttons and a one bar electric fire. Mr Ackerman did not waste money although I think he owned a button factory in Hackney somewhere. 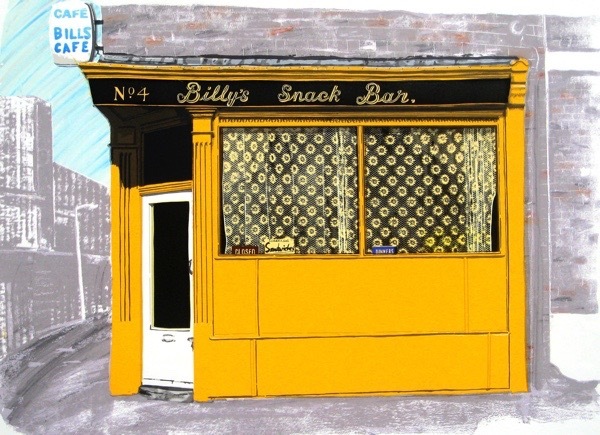 BILLY’S SNACK BAR (Screenprint) was on the corner of Pritchards Rd and Emma St. It stayed the same for years and, of all the shops I have made prints of, is still there with the same name but different signage. Wonderful prints of distinctive features now almost entirely disappeared from the East End: shop signs hand-made and misspelt, improvised window displays, and painted plywood all bodged and scuffed. 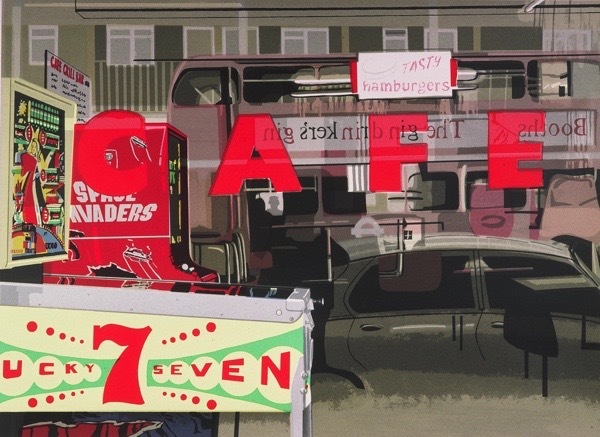 I especially admire the layers of transparency and reflections in ‘Café, Roman Rd’. A splendid book could be made of these works, accompanied by Janet’s sharp recollections of the shops’ owners and customers. Nice to see that she has exhibited this month at the Open House of my sister, Naomi Sack, in Brighton. 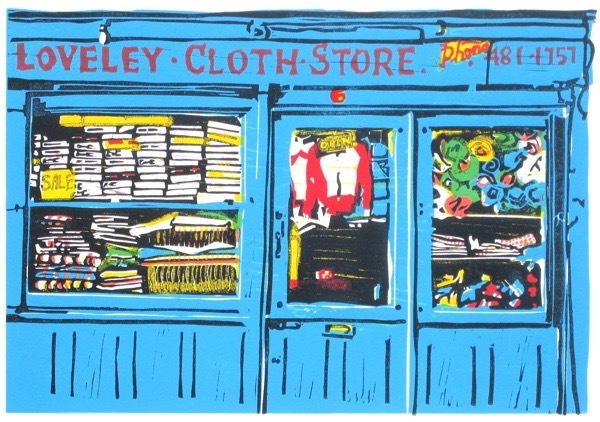 Two favourites… Jessie’s & Alban’s… However, the screen print of the Bangladesh Stores looks as if you could walk through that open door.. I did my Foundation course at East Ham when Janet was a teacher. Would love to get in touch and say hello, she was such a great tutor. Hello, were you at the Bishopsgate library last tuesday around noon and handed me a document about huguenots in Spitalfields? Later, back home in Paris i saw a small documentary on Youtube and recognized you. How strange: meeting the author of one of my favorite blogs in such a big town! By the way, i did the weavers walk on saturday and enjoyed it very much. Warm greetings. Great screen shots of a now vanished social history. Worth a visit.